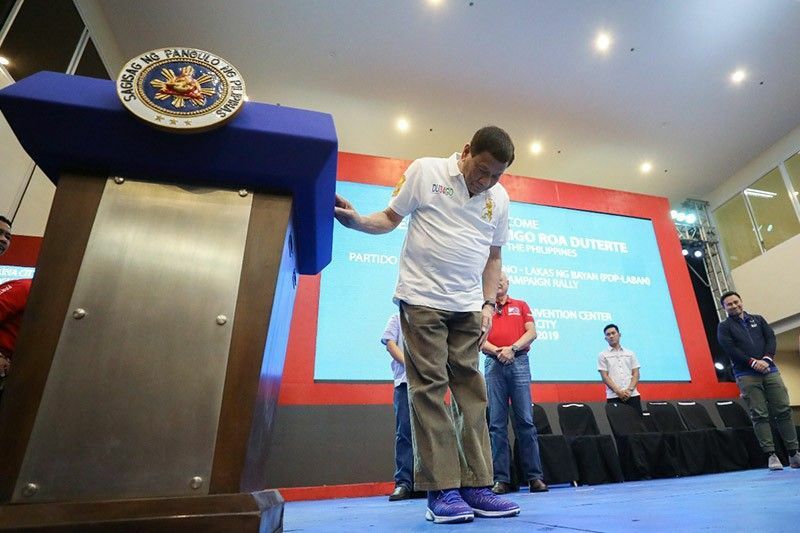 President Rodrigo Duterte bows before thousands of supporters at the Partido Demokratiko Pilipino-Lakas ng Bayan campaign rally at the Marikina Hotel and Convention Center in Marikina City on March 20, 2019. MANILA, Philippines — President Rodrigo Duterte expressed optimism that the complaint against China before the International Criminal Court would not affect the ties between Manila and Beijing. "No, I'm sure they don't. The Philippines is a democratic country anybody can bring a suit against anybody," Duterte said in a chance interview Thursday at the Army headquarters in Taguig. Former Foreign Affairs Secretary Albert del Rosario and former Ombudsman Conchita Carpio Morales submitted a communication to the ICC on behalf of Filipino fishermen "persecuted and injured" by Chinese officials. Their complaint said China's massive island-building caused a "near permanent" and "devastating destruction" of the environment which adversely affected not only "vulnerable fishermen, but [also] present and future generations of people across nations." They submitted the communication last March 15, days before the Philippines' withdrawal from the ICC. Duterte said that while former officials have the right to file a complaint, jurisdiction might become an issue. "Whether or not it will prosper or whether or not we have the jurisdiction, that's something else," the president said. "Remember, China is not a member of the ICC. We too, we were never, we did not withdraw because there was no law at all because of the flaw that it violated the Constitution. Publication of the law is very important so people would know there is such a law," he added. Duterte was referring to the Rome Statute, which created the ICC. The president said the treaty did not take effect in the Philippines because it was never published in the government's official publication. "Pag wala yan, walang publication patay (If there is no publication, your case is dead)," the president said. The Philippines on Sunday pulled out of the international tribunal tasked to bring to justice those accused of committing the worst atrocities of concern to the international community such as genocide, crimes against humanity and war crimes. The ICC, however, clarified that its initial inquiry into Duterte's drug war continues amid the withdrawal.